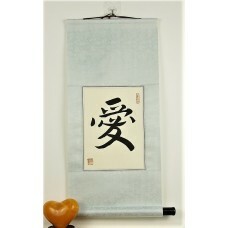 It has been popular in China to hang Chinese character art in the home or over the door for millenia. Most Chinese words are compound, meaning that they combine two or more characters to form one word. However, some characters are able to stand alone, largely because of their widespread use and deep meaning. Chinese also love to give good wishes to others, using these meaningful Chinese characters. Many of these characters are recited as parts of proverbs or poems or sometimes on their own as part of well wishing. It is especially popular to bless others with good wishes during festivals like Chinese New Year or for special events such as weddings. Giving a symbol scroll for blessing, happiness, or prosperity is a meaningful gift. We have compiled a list of popular single characters that look great on scrolls! These symbols espouse many of the virtues of Chinese culture such as love, joy, and wisdom. Many of these same character qualities are widely regarded in the Western world. 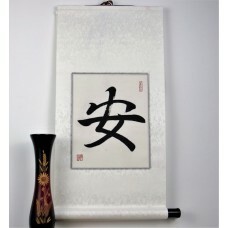 All of our scrolls are customizable by size and silk edging color. 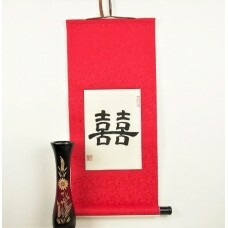 Simply browse our collection of scrolls, select the one you want, and customize it. 100% Hand Painted and Great Prices! All of our calligraphy is completely hand painted, no printing or machines here. We have spent tens of hours scouring the web comparing prices and features, and are confident our prices are the best on the web! This Chinese symbol is pronounced "an." It is normall combined with another Chinese word "ping" to.. This Chinese symbol can mean "bear," "tolerance," or "endures." It means to overlook other's wrong.. This is the Chinese symbol for "believe" or "faith." It is used for trusting in your friends or fo.. This Chinese calligraphy scroll features the character "forever" or "eternity." It is a nice gift .. This Chinese calligraphy symbol scroll features the character for "goodness." It is the main chara..
Chinese symbol for "grace." This is the main character in the two character compound word for grac.. This Chinese symbol means "holy" or "holiness." It denotes perfection. This is one of the characte.. This single symbol Chinese scroll features the character "wang," which means "hope." It is often c..
Joy Chinese calligraphy scroll. This symbol is used in many Chinese words to denote "joy" or "happ.. 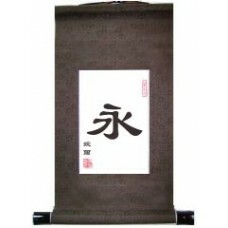 This character means simply "longevity," or "long life." This is a very common good wish to send o.. This Chinese symbol is translated as "peace," or "harmony." It is the simplest form for "peace" in.. This Chinese symbol stands for a very important concept in traditional Chinese culture. This Qi, o.. This single character scroll features the Chinese symbol for "righteous" or "righteousness." It is..